A love and devotion for the Blessed Virgin can only lead to a deeper fervor for Jesus in the Eucharist. This was one of the messages of Fr. Fernando B. Cenon, Mother of the Eucharist & Grace – House of Prayer (MEG) shrine administrator, in his homily on Sunday, Aug. 19, the Sunday after the Solemnity of the Assumption and before the Queenship of the Blessed Virgin Mary. “Devotion to the Blessed Mother is a devotion to the Holy Eucharist. Our veneration of Mary in the different, traditional activities of the Church should allow us to understand how Mary is one with us in asking for Jesus’ mercy,” stressed the priest. The oratory, declared a diocesan shrine in 2006, celebrated on Sunday its thanksgiving feast in honor of the Blessed Virgin Mary, in San Vicente, in this town. 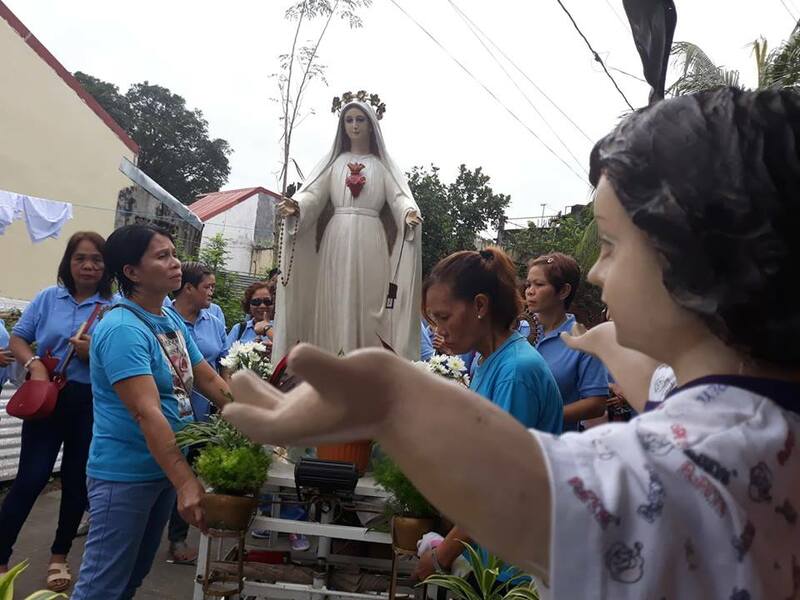 Cenon explained: “This celebration is meant to give the community an opportunity to kindle the devotion to the Virgin Mother in their lives as the communities around MEG are starting to be formed.” Though under the Sto. Niño Parish in Parada, Sta. Maria, communities in San Vicente barrio were established in the previous years to support the initial needs of the oratory-shrine. The MEG Diocesan Shrine began as a small chapel in its present lot in Sta. Maria in 1994 through the efforts of the community and of Carmelo V. Cortez, a visionary, who first introduced the title and appearance of Mary as “Mother of the Eucharist and Grace” to the faithful in the diocese. In the following years, the devotion spread to the faithful in different places, with healing Masses being held on first Saturdays of the month. The oratory was expanded in 1999 with the endorsement of the Bishop and with the help of the members of the Mother of the Eucharist and Grace Prayer Group who promoted the devotion in Manila, the Visayas, and abroad. In 2006, the late Malolos Bishop Jose F. Oliveros approved the parish’s petition for the oratory to be declared a diocesan shrine. With the devotion to the Virgin having an appeal to prayer and support for priests and seminarians, financial contributions from the shrine are distributed to both the MEG communities and the Immaculate Conception Major Seminary (ICMAS) in Guiguinto town, the house of priestly formation in the Diocese of Malolos. Cenon, who currently administers the shrine, is part of the ICMAS formation team, together with previous administrators. Through the devotion to the Mother of the Eucharist and Grace, the faithful believe vocations of seminarians are being fostered for the continuity of the mission of the local clergy.